The map below pre-supposes that the reader has just entered through the Farina entrance walls, and has stopped at the Reception marquee and Bakery..
RH image was shot by Lydia Sutton. Map kindly supplied by Bob Brownlee. Read about the history of each of these buildings. residents arrived to take charge of the wells at Government Gums in early March 1876. 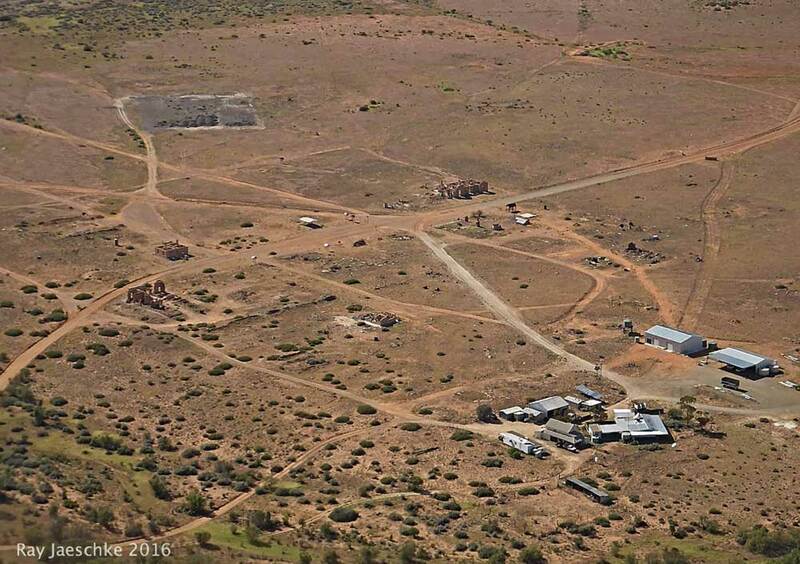 The earliest settlement appears to have been on the rocky hill across the Farina Creek to the north of the present town area, and to the east of the War Memorial. Some stone ruins and the remains of a stone well, which is the beginning of the present Wells Walking Trail, are in the area. north. The town flourished until the early 1900’s, but with the extension of the railway to the north, it went into gradual decline. The last residents left in 1967. The earliest structures were of wood, iron and cannvas. 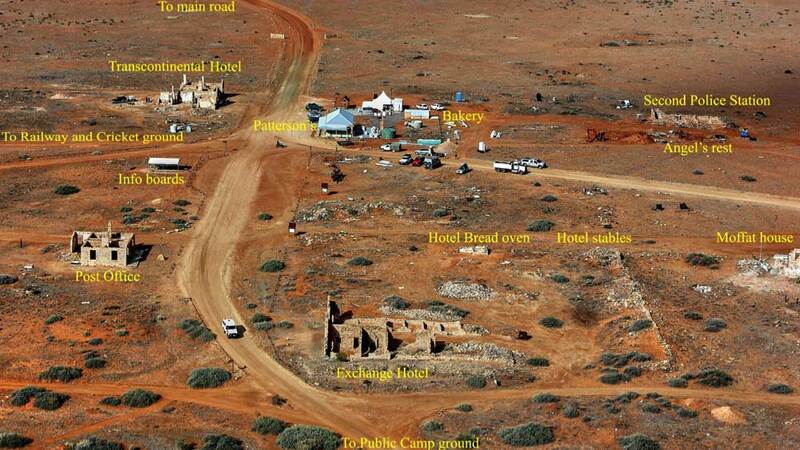 Several more substantial buildings of local stone were erected, and it is the remains of those, which are being preserved as examples of what was once a busy Outback gateway to north-eastern South Australia. The major remaining sites shown on the sketch map overleaf are easily accessible. Underground Bakery – The Bakery was restored to working order after 80 years of disuse, in 2010. It is used as a working bakery each year during May, June and July while the Farina Restoration Group is working on-site. Pattersons House – Originally a store and butcher, burnt down in the 1980’s it has been rebuilt in the style of the original building by the Restoration Group from 2017 to 2019. 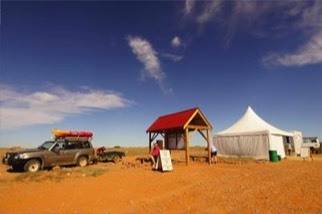 Transcontinental Hotel – The Hotel’s foundation stone was laid by a local Aboriginal woman on 5 June 1878.The Transcontinental Was the furthest north hotel in South Australia at the time. It was used variously through its life as a hotel, boarding house, and Cottage Hospital. It was closed as a hotel about gust 1918. The Moffatt House – This was one of the few masonry residences in Farina. It has been preserved as an example of the type of outback residence of its era. Post Office – The building dates from the 1890’s. Mail was taken from here to the railway station three times a week for carriage south to Adelaide. A connection to the Overland Telegraph Line was established at the Post Office. New Police Station – The first police station was a tent across the creek in the original settlement area. The second was a wooden slab building closed in 1935, and replaced with this building which in turn was closed in 1950. Exchange Hotel – This hotel opened in 1879, and closed in December 1937. Preservation work is being undertaken to prevent further deterioration. Both hotels maintained a sense of decorum as regards dress for meals, although they had a reputation for boisterous behaviour by their customers. 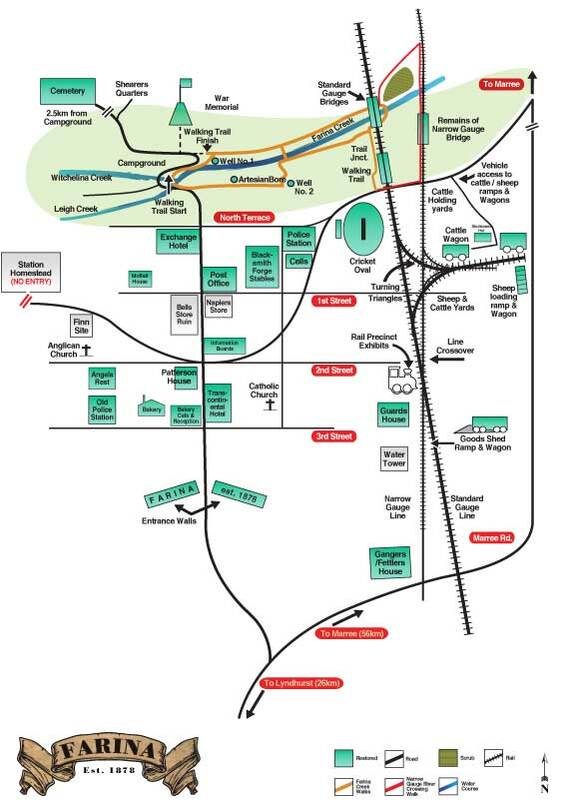 Railway Precinct – This includes the sites of the railway station, goods loading area, water tower, cattle and sheep loading area, Rail Bridge and Fettlers’ Cottages. The original narrow gauge line reached Farina in 1882, and was followed by a standard gauge line in 1957. The alignment of both gauges is shown by markers on the Walking Trail running through the Precinct between the railway bridge and Fettlers’ Cottages. rebuilt at the narrow gauge goods shed location adjacent to the water tower, and an 1880’s freight wagon. Cricket Oval – Farina enjoyed several sporting facilities including cricket, golf, tennis and horse racing. The cricket oval was restored in 2010, and is now used on community occasions. 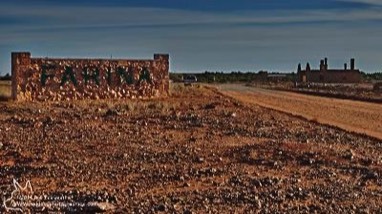 The tennis courts and golf course are off-road to the right of the Lyndhurst to Marree road approximately 2 km north of the turn-off into Farina. War Memorial – This was constructed and dedicated in 2010, and was the site of the first Dawn Service in the area, on Anzac Day 2012. Wells Walking Trail – This commences to the right through the entrance to the campground with the site of a well and stone tank. To access the rest of the Trail, return back towards the town centre. Approximately 75 metres after crossing the creek enter the Trail to your left. It extends for approximately 800 metres and ends at the Railway Bridge. The Trail passes two bores and a well, which clearly demonstrate attempts to find a permanent, potable water supply. Campground. The trail is for walking only, and not suitable for vehicles. A narrow gauge rough walking trail has been constructed along the narrow gauge Farina Creek crossing. Here much of the problems of the original narrow gauge track can be seen. Cemetery – Continue through the camp ground for approximately 2 km. 244 names registered as buried in the district and potentially here, are recorded on the cemetery storyboards. Very few graves are marked with memorials. Quartz surrounds mark many unnamed burial sites and memorial crosses have been placed on each grave. The cemetery also contains a number of Afghan graves in a separate section. Enjoy your visit to our town.